I believe that there are some sacred and ancient texts/manuscripts/diagrams that exhibit a holographic quality in that they are small pieces of a larger reality with enough information that you can reverse engineer the complete system if you look at it long enough. I am certain you are aware of the work being done on the Torah in which it behaves as almost a holographic film in which information is encoded that can be unlocked if you have the key/code as with Michael Drosnin's work 'The Bible Code'. I believe that the Mayan Calendar is such a text, and have been focusing my work specifically on the base 'Tzolkin' calendar which essentially makes up one of the 16 'months' (260 days each) of the solar cycle (~11.2 years in Earth time). When I first started learning about the calendar, I was looking at some of Jose Arguilles' work, who I am deeply thankful for. I believe the academy has tried to kill the role of imagination in knowledge, calling it misinformed, and that on some level his work was a victim of academics not understanding the nature of receiving information in the way he did. I depart from his configuration of the 8 Tzolkin grid matrix he proposed in one important way, which you will see below. At some pointed I decided to focus purely on the grid (13X20) as a Mathematical entity. I came across Marko Rodin's work, and then of course, Randy's, and when I was watching this video I had an epiphany. It was specifically what Randy Powell said about 'mirroring'. 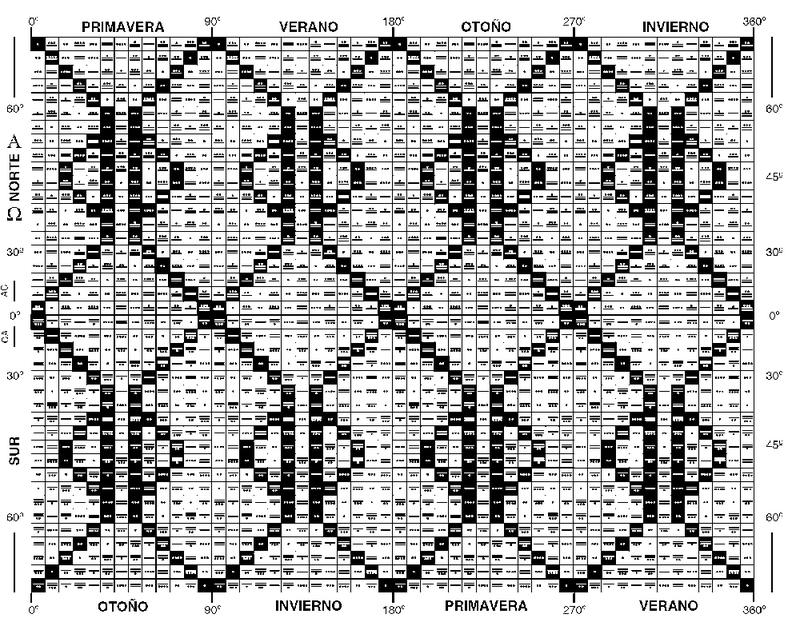 This is where I depart from Arguilles' work, in the arrangement of stacked grids. In Arguilles' concept he flips the grid over once on the vertical axis and once on the horizontal axis. I wanted to see what would happen if you just flipped the grid once on the horizontal axis, and then spliced the two together like a battery. You can see above that the lower four Tzolkin and the upper 4 Tzolkin are not Mirrors. In Arguilles' Psi Bank, the top and bottom are flipped BOTH horizontally and vertically. In my work, although I tested Arguilles' set as well, I chose to only flip the grid horizontally. I have created a program to analyze all sorts of assortments of what happens when a matrix/grid get spliced together with their various mirrors in various ways (drool). It is still in it's infancy, but I wanted to present it here so that you can follow along what I am saying in this blog and play with it if you wish. I am also attaching some drawings, but want to explain what I did here. The Tzolkin calendar is basically a 13x20 grid in which one starts at the upper left hand corner and counts from 1 to 13 moving downward in the columns and then to the right, over and over again 20 times so that in total there are 13 columns with 20 rows. I have been looking at the mathematical relationships in that grid as a stand-alone single unit, as well as in a larger matrix of quarter (4 Tzolkin) and half (8 Tzolkin) solar cycles. There are three things I noticed in Randy's presentation that resonated with what I was doing. The first is that much of the information Randy was working with is contained in a similarly derived matrix of 15x3in mod9 (drawings also attached below) which I had also been playing around with. The second, is that if you 'mirror' any of the matrices onto themselves (photos below) by inter-splicing them in a syncopated manner, the order of the matrix is enriched, and the relationships of the numbers in that 'mirrored' matrix seem to contain recipes for the toroidal system it's matrix describes. The the third is the connecting principle between my work and Randy's. The conversion between my spliced matrix and Randy's donuts is essentially a 'pivot table' type of situation. Look at the base-9 matrixes that you create, and imagine that instead of looking at those as a grid of squares, you turn it 45 degrees and look at it as a grid of diamonds. The diamond grid essentially can be seen as two grids spliced together. The corresponding grids are connected through their points instead of their lines. So the initial grid that composes the mayan calendar, for example, when spliced together with it's mirror create a matrix very similar to the ones Randy is using to define Toroidal energy patterns. Secondly, the AHBA (mod9) original Vortex grid has a third number that is introduced that defines the height of the grid so that number is no longer associated with the second number of the matrix (in this case 9 because he uses mod9 numbering). The basic idea that was inspired by Randy's video was the interlocking of the grid and it's mirror together in a larger alternating grid. I have indicated the two grids spliced together by giving them each a different color which you can see in the first series of grids. The matrix building and evaluation tool above takes this spliced grid and feeds it strong drugs. More specifically when I looked at different patterns of numbers in the grid I noticed that the patterns created by odd and even numbers seemed to correspond with rows that have repeating adjacent numbers. I then ran some calculations and realized that there is a concept of 'scale' in the sense of music. That the top row of the original matrix has a series of repeating numbers in a certain order that is repeated in every row of the original matrix. This number series seems to operate in a similar way that a musical scale would, in that it defines the underlying order of a piece of music. In the spliced matrix, there are sine-like waves that appear in specific sections between the rows of adjacent equal numbers. These sine waves can move forward or backwards relative to the order of the original scale, they can have varying wavelengths, and they seem to alternate direction at in the rows that are filled with repeating adjacent numbers. Not only that, those crests of waves seems to also function in switching the polarity of the wave. In the spliced matrix, polarity refers to whether the waves are using the original grid columns or the columns from the grid that I flipped horizontally and spliced into the original matrix. In the 13x20 system, the scale is always the same: 1, 7, 13, 6, 12 ,5, 11, 4, 10, 3, 9, 2, 6, 1 (all 6 digits apart in a 13-base counting system and which connected in a circle seem to create a pattern similar to a coil winding) and which can be seen below regularly switching 'polarity' as they move from one crest of the wave to it's opposite. 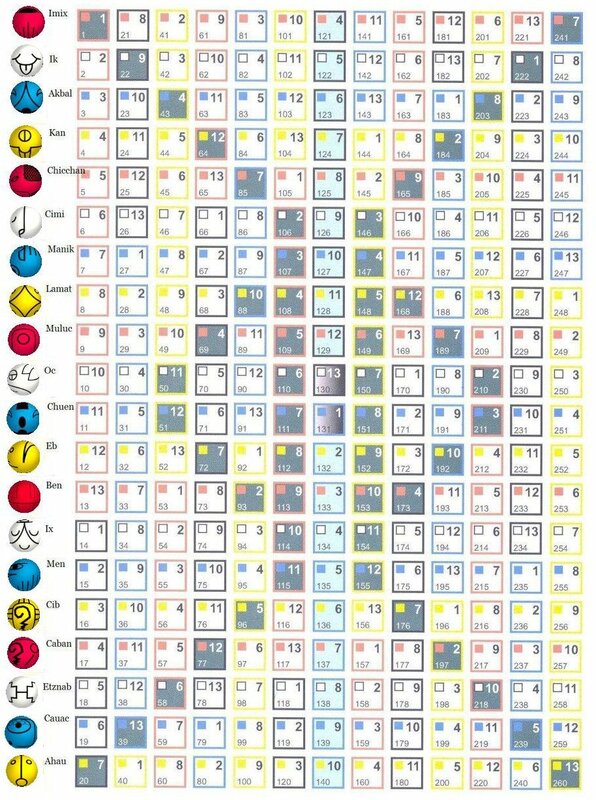 As mentioned above, note in the 13x20 grid based on the Mayan calendar is that each instance in which the polarity switches happens at either the low or high extreme of the wave. I found these patterns to be extraordinary (as well as others that I would be happy to detail in future discussions). An order that cannot be accidental. In the drawings on the 13:20 grid colored in, the blue ratio like numbers (some of which are incorrectly marked on the drawing I sent but correct in the tool I have linked you to above) represent fractions denoted by how many integers are between each number in the row. If you notice in the attachment here the ratios creates by these numbers all exist along a diagonal line of the Lambdoma Matrix of Harmonic Internals. The tool I created goes beyond this mayan Tzolkin set (13/20) and can evaluate an infinite set of pairing of numbers (within the bounds of the bandwidth of my server) and also generates calculations of the harmonics generated in each row. Generally, the rows of repeating numbers have harmonics of 'zero' or 'infinity' where the sine waves change polarity and switch direction at theirs crests. But I do not want to spoil it for you, go see for yourself! Moire Patterns: macro patterns that reveal micro patterns. Ever drive under a pedestrian bridge? I was living in Portland Oregon when I was younger, which has a lot of them. The city of Portland is concerned enough about the visual beauty of it's structures, that instead of using the normal gate grating to prevent suiciders from jumping off them, they often use instead metal walls with repeating patterns (like circles or plus signs) cut out of them. When you pass under one of these bridges, although you may not be able to see the actual shape of the hole cut through the wall from your car, the pattern formed between the two grates will magnify the shape of the original holes being used in those grates. So Moire Patterns seem to magnify an underlying reality. The trick is that when you move under the bridge, the patterns between the two grates continue to form and reform themselves as you go under. I started seeing these matrices as a sort of Moire Pattern, but wanted to test my assumptions. In this case, I specifically wanted to know what would happen if I move the two spliced grids up and down with respect to each other. Would the wave forms remain in tact? If they do, my presumption is that they are magnifying and underlying reality contained in the original grids. So I made an offset component that you can see on the jellomatrix tool I built. It turns out, the wave forms stay in tact. This, in my mind, indicates that these spliced grids do reveal a phenomenological coherence that reveal something about the relationship between these two numbers used to form the grids, and the methods used to create the spliced grid itself. Next steps are to understand better what this coherence reveals. At some point, it has become interesting to me to start running experiments in the physical world that are based in the mathematics I have described above. Interestingly, when the grid is modeled in the physical world, what ends up getting built is a system of co-mingled air-core (this could change) inductors. These are created by starting with a donut shape that is empty on the inside (I have a plastic round pill container that I am using from the drug store that I bought because of it's shape). In this case I was modeling the 7 by 'x' coil. I believe the 'x' is filled in with pulse sequencing. I started by using a long wire, and began wrapping the wire around the donut to create 7 wraps around the donut, at that point I kept wrapping the wire over and over again (in this case 10 times) in a way that traced the same pattern over the initial wrap. Then, with another wire and in between the 7 coils already wrapped, I wrapped another wire around the donut and also repeated it 10 times around. And so the experimentation is beginning. I am working with attaching different components (like a variable resistor or a variable capacitor in series or in parallel) into the circuit in different ways, and am running sequenced pulses of DC current through the system and testing it on an oscilloscope. I have another module that I have created that uses a fluorescent lighting tube as the donut shape, and works with the number 13 instead of 7. What is interesting at this point in my search is to understand this system with a beginners mind. Any person who has tested applications of systems that have not yet been investigated or invented as it were, has the same problem, namely that of creating experiments on the system such that we are aided by the common understanding of these systems, but not enslaved by them. I am looking for things that others overlooked, or that were scrapped up to a 'dirty signal' or 'a strange but unuseful result in a circuit that is avoided because it creates 'noise' in a circuit. So instead of avoiding the noise, I am reading it. And what I have been reading so far is interesting. What I am finding is that when even a small and consistent DC voltage/amperage is applied to the system, the coils seem to fill up with energy, and then burst, and then repeat the pattern over and over again. This burst can be seen on an Oscilloscope as an explosive increase in voltage that disturbs the other coil. And on a Gauss meter, it can be seen as a sizable and momentary pulse of EMF radiation. I believe that these bursts of voltage/current/EMF radiation are significant. I am working with being able to control them both by timing the pulses of voltage through the system and by adding other electrical components in various orchestrations through the circuit. As I continue testing, I will be posting my results here, so check back! Wave Topologies encountered in the spliced Mayan Calendar by Ana Willem is licensed under a Creative Commons Attribution-NonCommercial-ShareAlike 4.0 International License. Based on a work at http://jellobrain.com. In truth, without deceit, certain, and most veritable. That which is Below corresponds to that which is Above, and that which is Above corresponds to the which is Below, to accomplish the miracles of the One Thing. And just as all things have come from this One thing, through the mediation of One Mind, so do all created things originate from this One Thing, through Transformation. The Wind carries it in its belly; its nurse is the Earth. It is the origin of All, the consecration of the Universe. Its inherent Strength is perfected, if it is turned into Earth. Separate the Earth from Fire, the Subtle from the Gross, gently and with great Ingenuity. It rises from Earth to heaven and descends again to Earth, thereby combining within Itself the powers of both the Above and the Below. Thus will you obtain the Glory of the Whole Universe. All Obscurity will be clear to you. This is the greatest Force of all powers, because it overcomes every Subtle thing and penetrates every Solid thing. In this way was the Universe created. From this come many wondrous Applications, because this is the Pattern. Therefore am I called Thrice Greatest Hermes, having all three parts of the wisdom of the Whole Universe. Herein have I completely explained the Operation of the Sun.